Baroden Cottage stands in its own private garden with terrace offering wonderful views across the valley. On the ground floor the spacious living room has French doors onto the terrace. There is a fully fitted kitchen with electric oven and four burner gas hob, large fridge/freezer, dishwasher, washing machine, microwave and coffee maker. The lounge has two two seater sofas, coffee table, 32" TV, DVD and CD player....DVDs and CDs available. A pine staircase leads to a landing off which there is a beautiful main bedroom with double bed and en-suite with shower and bath, and a lovely twin-bedded room with en-suite shower room. The cottage is attractively and comfortably furnished and well equipped with good quality modern fittings and utensils. An additional room is available in our main home with en-suite bathroom if a bigger party wants to stay. Outside, the terrace has table, chairs, permanent BBQ and deckchairs, umbrella and rotary washing line. The walled pool area is a secluded sun trap to be shared only with the owners - we will not use the pool when guests are staying. The pool is open mid May to mid September, weather permitting. The price is inclusive of all utilities, bed linen, towels, including pool towels, and use of the swimming pool. We provide Internet access but neither Homeaway nor the property owner are liable for any loss or interruption of internet service. What to do in the area: Without a doubt the main attraction is the beautiful town of Brantome which is about ten minutes drive away. Beautiful restaurants, canoeing, the historic Abbey and the wonderful riverside market attract visitors from all over Europe. You will never get tired of Brantome! There are beautiful country walks starting from our door or, a few miles away there are caves to explore and miles of marked walks and cycle routes. The wild life is amazing! Watch out for deer, wild boar and a wide variety of wild birds, including Hoopoo's. Within a short distance there are fabulous chateaux to explore and historic villages and towns. Within 40 minutes there are the historic sites of Angouleme and Perigueux for day trips and soaking up the atmosphere of these beautiful cities. A Typical Day: Relaxation is the key. We find so many of our guests just love the peace and quiet, views, wildlife, the warm sunshine and just relaxing around the garden and the pool. Long warm evenings sampling local wine and enjoying a BBQ after a day of wandering around Brocantes or just relaxing. Be woken up by birds singing, roll over and enjoy the peace and quiet, sometimes even a tractor passes by...but, for all that, ten minutes and you're in the buzzing town of Brantome. We try to keep a wide selection of books and we welcome you leaving your favourite holiday read and being free to take a book home with you that maybe you haven't quite finished. We have a few garden games and you are always welcome to borrow the boules. What the photo's do not show: Both bedrooms are on the first floor, the double bedroom to the front of the cottage has views across the valley whilst the twin bedroom at the rear of the property has a velux window which keep the cottage cool in summer. There is a shower and toilet en suite from the second bedroom whilst the main bedroom has a bath, shower and toilet en suite. All the bathroom fittings are modern white suites. There is adequate room in both bedrooms to accommodate the child cot. The pool is a short walk (around 30 seconds) out of the cottage garden and then into the main garden. The pool is in it's own private enclosure and has pool furniture and loungers - with cushions. If you have children then you can relax knowing that they cannot access the pool without you knowing. Wireless internet Neither Homeaway nor the property owner are liable for any loss or interruption of internet service. Tea, Coffee - instant and filter, sugar, milk, cooking oil, olive oil, salt and pepper, foil, cling film, rubbish bags, 4 dishwasher and washing machine tablets, washing up liquid, 4 toilet rolls. 32" TV with European and Freeview English channels available. Enclosed private garden with terrace, potted plants, lawn, shrubs and a fig tree - please help yourself to the fruit. Deck chairs. Private terrace with table and chairs and built in BBQ. Wonderful view overlooking open fields, at the right time of year fields of sunflowers. 8 x 4 m pool located in the owners garden but totally private within a walled area. A delightful sun trap with sun loungers, table, chairs and umbrella. The secluded/private walled swimming pool is situated in the garden of the main house with plenty of room for soaking up the sun or sitting in the shade. Safety is important. The pool is surrounded by a wall and gate. The cottage has fire blanket, smoke alarm and fire extinguisher. A basic first aid kit is also provided. There is a selection of holiday reading and games and we encourage you to 'leave a book ...take a book' to help build up a good selection of reading material. Internet access is available and we are happy to give you the access code however neither Homeaway or the property owner are liable for any loss or interruption of internet service. The cottage has good quality matching crockery, cutlery, cook-ware etc.. The towels and linen are of a good quality and the cottage is cleaned to a high standard. You can expect to arrive and feel comfortable immediately. We had a very happy week's stay at Baroden. The pretty cottage, and the owners were a delight. The cottage is attractive, spotlessly clean and so thoughtfully provided for by Suzy and Steve, it made us feel immediately at home. The area is beautiful but also interesting to be in the heart of a farming community. An ideal location to wind down and have a very relaxing holiday. The cottage was very well equipped, clean and tidy. There is a lovely outdoor eating and barbecue area and we made good use of the pool which is excellent and very private in fact the only noise we heard was the humming of the insects! The hosts, Suzy and Steve, are very friendly and hospitable and made us feel extremely welcome and nothing is too much trouble. We would have no hesitaion of re-booking this cottage if ever we come to this region again. We have just come home from a wonderful 2 weeks at Baroden. The cottage is lovely and so well equipped. The garden has a beautiful view and the pool is perfect. Suzy and Steve were such welcoming hosts. The nearby towns of Brantome and Bourdeilles are beautiful and even in peak August were not too busy. We have come home with a Welty of family memories. Thank you for taking the time to write a review. It was lovely to meet you all and I hope we have the opportunity of welcoming you to Baroden again. I trust you enjoyed Paris and had a safe journey home. We know this area well and have been to a couple of locations in the past. Baroden hit all the right spots and we felt relaxed and comfortable throughout our stay. Close enough to the restaurants and shops in Brantome and Peregueux but far enough into the countryside to be quiet, dark and secluded. All we needed was in the gite and more.......everything catered for. Thank you to Suzy and Steve - we loved it, we’ll be back! We are still in the holiday mode so it must have been exactly what we needed! 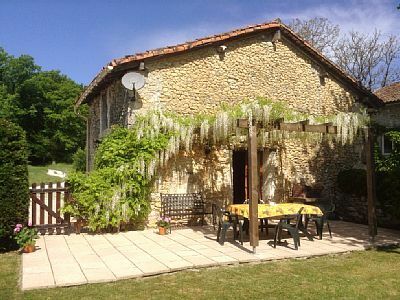 Fabulous gite, beautiful location, made even better by the warmth and welcome of the owners Steve and Suzie. Highly recommended, we absolutely loved it. Thank you taking the time to write such a kind review. It was a delight to meet you both and we hope to have the pleasure of your company again. Leguillac De Cercles has it's own bakery selling cakes, pastries, bread and a few grocery essentials. Rates are subject to change until reservation is confirmed. We request arrival after 2:00 p.m. and departure before 10:00 a.m.